Step lift suitable for both internal and external applications with a maximum vertical travel distance of 1000 mm. With half height gate at the upper landing and an automatic retaining ramp at the opposite end, the unit is suitable for all wheelchair users with a capacity of 300 kg. 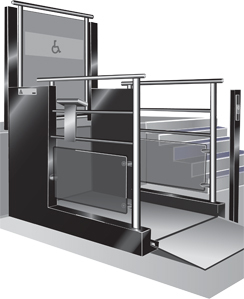 Special finishes include brushed stainless steel handrails, glass upper gate and special colour alternatives which all set the A2000 step lift apart from the run of the mill step lift available on the market today. Single interlocked self-closing upper landing gate. Power driven automatic retaining ramp. Nitro-carburized finished steel and aluminium construction. Bleu 700 Sable (Collection Futura). Non-slip flooring, slate grey powder coated finish. Up, down and stop buttons on platform. Call push buttons at each landing. All push buttons are tactile and illuminated. Fitted on platform to assist user when entering or exiting the lift. Bi parting traveling barriers arms on end of platform. Automatic power driven travelling ramp/ wheelstop on platform. Provided to announce lift arrival at landings. Single swing interlocked gate, manually operated with self-closer. Alarm: The unit has a battery backed alarm. Emergency lowering: Manual emergency lowering provided. In the event of mains power failure the lift can be lowered to the ground floor by operating a push button below the internal control panel. Emergency operation: The lift will operate up to 15 full cycles in event of power failure. Safety gear: The use of anti-rupture valve prevents the rapid descent of the lift in the event of a hydraulic hose or pump failure. Gate release: By special supplied key. Safety edges: Platform and ramp safety sensitive devices provided. A safety skirt is provided around bottom of platform to prevent lift from trapping. 240 V, 50 Hz, 13 A fused spur supply, direct 24 V DC powered, battery back-up provided. The product information below is from the NBS Plus library of product clauses offered in NBS specification products. It has been created by NBS for CIBES Lift UK. Each product clause is authored in NBS format and is intended for inclusion in project specifications. Please note that NBS product guidance is not a replacement for the manufacturer's literature and it is recommended that CIBES Lift UK be consulted before specifying.